Scarey, isn’t it?! Though I stress that this is an oversimplified equation. Phenotype is the result of genetic factors (the genotype) and nongenetic factors (the environment). Not all phenotypes have nongenetic influences—a pup born with brindle coat genes is going to be brindle whether born in a temperate zone or the heart of a desert. But many phenotypes do, and this should be considered when embarking on a breeding programme. Consider exceptional stud stock, known to produce high quality progeny over and over. Now consider those progeny raised during extensive drought with no supplementary feeding. Those babies have to-die-for genotypes (as evidenced by their pedigrees), but those genes won’t manifest as to-die-for phenotypes. Those babies will probably grow to be stunted, malnourished adults underperforming in the traits they were bred for. An example is medium wool sheep raised in harsh conditions so as to grow (force) a lower micron fleece than their genotype would otherwise code for. The animals are not at peak performance, and while the wool will be fine[r], it will probably be brittle and susceptible to breakage when processed on high-speed industrial machinery. Compare this to genetically-fixed fine wool sheep consistently producing a low micron fibre of even diametre and strength in less harsh conditions. E in the simple formula above is often taken to be physical environment. This includes availability of feed, feed quality, water quality, altitude, soil, and the weather and seasons. But E includes more abstract factors which are also environmental (nongenetic) influences on phenotype. These are: fixed resources, management, and economics. Fixed resources are such things as farm size, workable land and labour - can additional, more nutritional feed be grown to boost phenotypes for example? Management is the farmer’s policies. Policies could include supplementary feeding, vaccinations and deworming to increase animal health, which in turn leads to more productive phenotypes. Or a breeder may introduce animals with better genotypes to his herd to improve future generations’ phenotypes. Economics covers all farm inputs (costs) and outputs (prices for animals and their products). Feed, labour and husbandry inputs can all affect phenotypic outputs, which in turn influence prices obtained. The goal of breeding is to improve phenotype by improving genotype, but there is more to this than simply cobbling together a pedigree with desirable ancestors. Remember that P = G + E, and neither G nor E can be taken in isolation on your quest for P nirvana. Rather, you need to consider an animal as part of a system, something we’ll go into more in the next post. The animals are the genotypic input, with the rest environmental inputs. All these parts interact and ultimately influence the end phenotypes. When you have a group of parts interacting to create a whole, you have a system. Here, the farm is a system and the animals and environmental inputs are the parts of that system. A breeder strives to improve phenotype by improving genotype. But for maximum genotypic improvement, a breeder must also consider his animals as part of a system, subject to the interactions of other parts, and make decisions accordingly. And these decisions could be different for different breeders, as their personal systems also are different. For example, alpacas in Australia occupy a wide range of temperate climates, and management practices change to suit. Paralysis tick can be fatal on the east coast if not controlled for, but not in the drier inland where it doesn’t exist. Shearing and birthing are timed, for the most part, earlier with decreasing latitude. It was not uncommon for breeders located in the subtropical north in the early days of the industry to relocate to the temperate south, having lost valuable breeding stock (genotypes) and their young to ticks and the vagaries of hot humid weather that set them back several years. Nowadays most alpacas are found in the traditional wool sheep regions of the country. The environments favourable to wool sheep genotypes would appear to also be favourable to alpaca genotypes. The next four posts will go more deeply into genotype-environment interactions, and how knowledge of these can improve breeding programmes. As mentioned in the The Animal is Part of a System post, the distribution of alpacas in Australia may be aligning more with the traditional distribution of wool sheep, as breeders move from areas their animals don’t do so well in, to areas other people’s animals are doing well in. It is interesting to compare this (p2)  and this  distribution map for sheep with this  one for alpacas. It wouldn’t be surprising for alpacas to do better in temperate regions than subtropical regions. Their native habitat after all is the Andes at altitudes of 3,500m to 5,000m. You may expect alpacas to do even better in their native habitat again. Yet this isn’t necessarily the case. Many alpacas have succumbed to unusually cold winters in the Andes  that would probably have been completely unaffected in warmer winters elsewhere. You may think from all this and the title of this post that the location of an alpaca and its performance in that location is a genotype-environment interaction. (Also called genotype by environment, or G × E) But it isn’t—it is simply an example of one environmental effect on genotype, ie a nongenetic influence on animal performance. A genotype-environment interaction is one where there is a difference in performance between two or more genotypes in two or more environments. Going back to alpacas. There are two alpaca fleece genotypes: the huacaya and the suri. Huacayas have sheep-like crimpy wool that grows outwards from the body, while suris have fibre “dreadlocks” that hang like curtains on the body. Pictures can be seen here. Suris are much rarer than huacayas in the Andes. One possible reason—though not a sole one—could be because the suri fleece type, with dreadlocks hanging either side of the body, results in an exposed line along the back. This exposure would make them more susceptible to cold, wet, windy conditions at high altitudes than the more evenly covered huacayas. Yet both suris and huacayas thrive equally well in Australia where temperatures can hover around freezing during winter in many parts—though without shelter suris are still adversely affected by cold, wet and windy weather . If this is the case, we do now have a potential genotype-environment interaction. The two genotypes are suri and huacaya, and the two environments are an Andes winter above 3,500m and a still cold, though milder in comparison, Australian winter. Please note the following is merely to illustrate a point. It is not based on real data and in no way implies a real situation. where the huacaya geneotype performs better in the more extreme environment, but both genotypes do well in a less extreme environment. But note how the difference between huacaya and suri performance in the Andes is greater than the difference between the same two genotypes’ performance in Australia. Thus a G × E interaction is evident, as the difference in performance between the two genotypes is also different between the two environments. It’s important to realise that graphs of G × E interactions always have the lines converging, diverging, or even crossing. A G × E interaction does not exist if the lines are parallel. This is because there is no difference between the genotypes in different environments—each genotype has been negatively, positively, or neutrally affected equally. The following is merely to illustrate a point. It is not based on real data and in no way implies a real situation. Here, the two lines representing susceptibility of each genotype to cold weather are parallel. In other words, the difference in performance is the same for each environment. A huacaya genotype appears equally less susceptible to cold weather than a suri genotype in both climates. There is no G × E interaction here, as both genotypes changed their performance by equal amounts when the environment changed. This graph simply describes a simple environmental effect on two genotypes, not an interaction between genotypes and environments. You must always have at least two genotypes and at least two environments to show a genotype-environment interaction. Graphing these makes visualising the interaction so much easier. The vertical axis represents the outcome you are measuring, and the horizontal axis represents the environments you are comparing. You will have a G × E interaction only if the lines are never parallel. The next few posts will cover more examples of graphed interactions, some real examples in the animal world, and how knowledge of G × E interactions can help develop suitable breeding objectives. Meat & Livestock Australia. 2016. Cattle Herd and Sheep Flock Population Changes: 2015-16 on 2012-13 percentage change. p2. Retrieved 9th February, 2018. Meat & Livestock Australia. 2017. Sheep Numbers Map 2016-17. Retrieved 9th February, 2018. AgriFutures Australia. 2017. 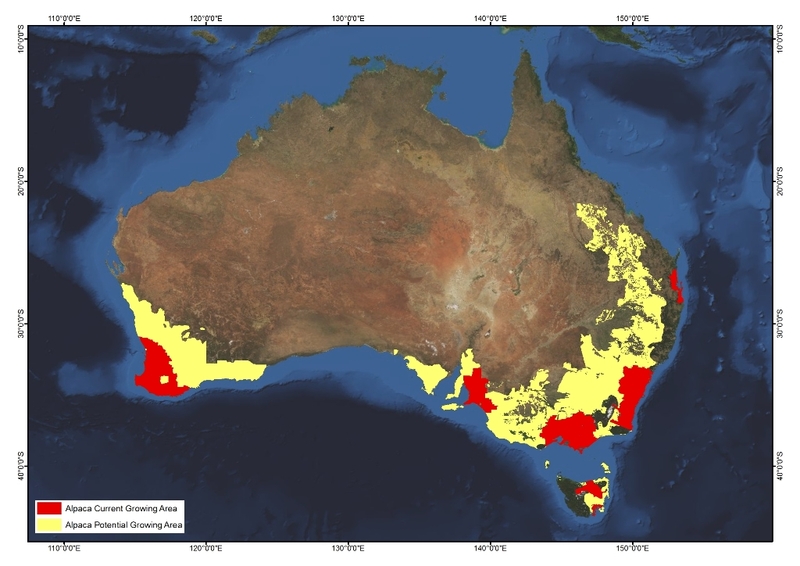 Alpaca Current and Potential Growing Areas. Retrieved 9th February, 2018. Vice News. 22nd July, 2016. Llamas and Alpacas are Dying because of an Unusually Cold Winter in the Andes. Retrieved 9th February, 2018. Shangrilah Alpacas. 2012. Dispelling Myths About Suri. Retrieved 9th February, 2018.